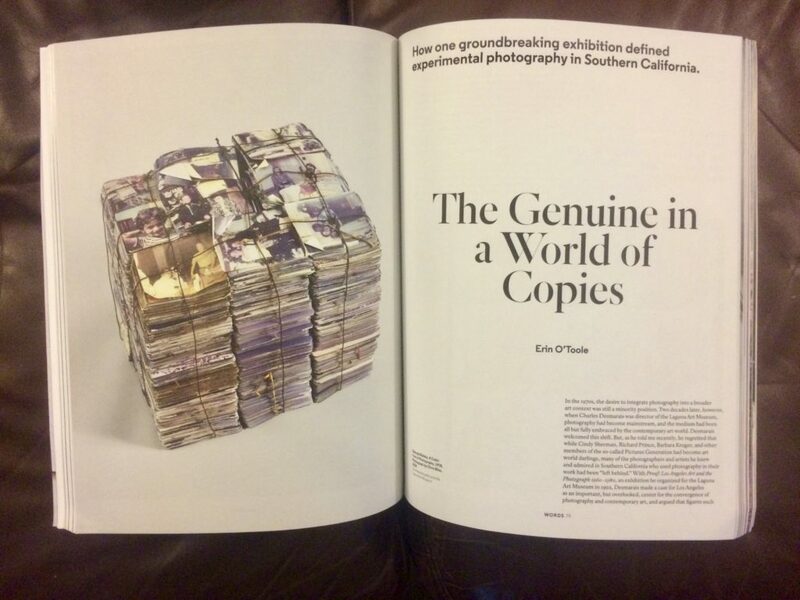 The Genuine in a World of Copies by Erin O’Toole. FSU Art Professor Emeritus George Blakely was mentioned in and had an image of his artwork, A Cubic Foot of Photographs, published in Los Angeles Aperture Fall 2018. The article references the exhibition Proof: Los Angeles Art and the Photograph 1960-1980, an exhibition Charles Desmarais curated in 1992 for the Laguna Art Museum and that subsequently was exhibited in museums around the country. Desmarais made a case for Los Angeles as an important, but overlooked, center for the convergence of photography and contemporary art, and argued that figures such as Robert Heinecken, along with artists Ed Ruscha, John Baldessari and Wallace Berman had anticipated, in some cases by several decades, many of the concerns that would later come to define postmodernism and the work of the Pictures Generation Group. A recuperative project like Proof was, in the 1990’s an intervention, at least in part because the New York-centric art world had long considered Southern California to be an artistic backwater and had been, until relatively recently, reluctant to embrace LA artists.